Somebody will ask those of us who compose with the aid of computers: 'So you make all these decisions for the computer or the electronic medium, but wouldn't you like to have a performer who makes certain other decisions?' Many composers don't mind collaborating with the performer with regards to decisions of tempo, or rhythm, or dynamics, or timbre, but ask them if they would allow the performer to make decisions with regard to pitch and the answer will be 'Pitches you don't change.' Some of us feel the same way in regard to the other musical aspects that are traditionally considered secondary, but which we consider fundamental. 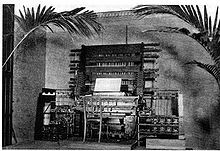 As for the future of electronic music, it seems quite obvious to me that its unique resources guarantee its use, because it has shifted the boundaries of music away from the limitations of the acoustical instrument, of the performer's coordinating capabilities, to the almost infinite limitations of the electronic instrument. The new limitations are the human ones of perception. Milton Babbitt, quoted in Classic Essays on Twentieth-Century Music. Edgard Varese, quoted in Classic Essays on Twentieth-Century Music. This page was last edited on 29 September 2015, at 21:43.